Excellent golf courses, impeccable hotel room, and luxurious amenities. 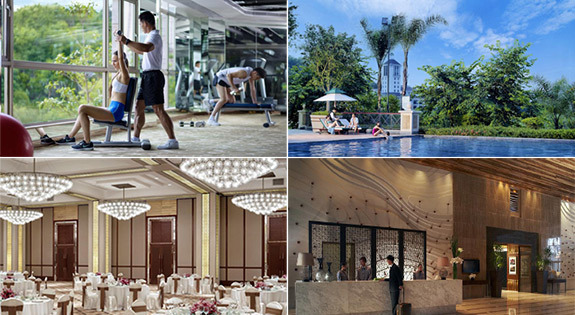 These are only a few of the undoubtable reasons why Mission Hills, Dongguan is the perfect destination for your next golfing trip! 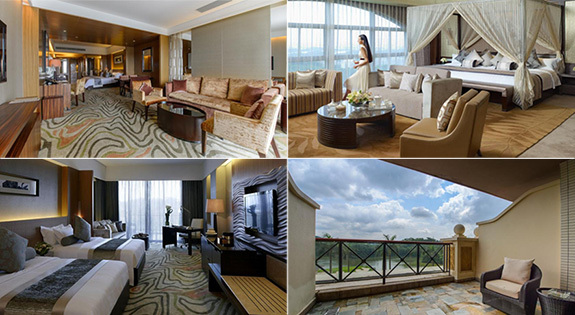 Not only has it been rated a 5-star golf resort by tens of reviewers, but it is also strategically located between the boundary of Dongguan and Shenzhen to ensure you a peaceful and relaxing stay. This establishment features five 18-hole championship golf courses that were designed by some of the world’s greatest golf legends and architects. We want to offer only the best and that’s whyGolfPackages brings you these packages for you to experience a premier golfing experience and splendid holidays! 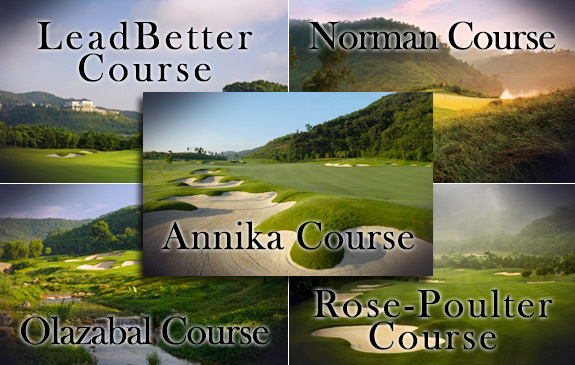 Annika Course. This 18 hole 72-par golf course was designed by the LPGA Hall-of-Famer and first female to compete in a PGA Tour event in 2003. She is none other than Annika Sorenstam who worked in collaboration with Schmidt-Curley to both drafted this beautiful course. The Annika Course is composed of wide-ranging mountain views, fiercely designed bunkered fairways, luxuriant valleys and challenging greens. Rose-Poulter Course. This 18 hole 72-par course was designed by Justin Rose, the winner of 2013 US Open and Ian Poulter, the winner of 2012 WGC- HSBC Champions. Both are members of the PGA & European Tour. As teammates they won the2012 Ryder Cup and World Cup of Golf. This course is well known for golfers because there is a high chance of scoring birdies and hole-in-ones. It also features several hazards such as water threats, deep bunkers and rich native vegetation, which also contribute uniqueness and appeal to this course. Leadbetter Course. This 18 hole 72-par course with 7,155 yards was designed by David Leadbetter. David Leadbetter is popularly known as one of the world’s finest golf instructors. He was able to do collaborations with some of the golf legends like Nick Faldo and Ernie Els. With its wooded hills as its surroundings, undulating fairways, large bunkers, it will surely give you a challenging yet fun golfing experience. Olazabal Course. This 18 hole 72-par course with 7,320 yards was designed by Jose Maria Olazabal, who is one of Europe’s best golfers. He has won two Masters titles. This course has hosted many prestigious events including the 2012 HSBC World Golf Championship and 2007-2009 Omega Mission Hills World Cup, which is usually referred to as the“Olympics of Golf”. Found here are heavily bunkered sand belt flair, undulating fairways and natural flowing streams to add excitement to your game. Norman Course. This 18 holes 72-par course with 7,228 yards was designed by the Australian “Great White Shark” Greg Norman. Norman has achieved winning 90 international tournaments during his career and is now known for his course design and vineyard properties. This course is very rich with picturesque valleys, tall native grasses, manicured fairways and dramatic views. It is also surrounded with Wooded Hills and won as 6th best golf course in China in 2012 Golf Digest. Mission Hills Resort is arranged over 21 floors and consists of 334 spacious and well designed rooms. Each beautiful room is provided with a balcony complete with a coffee table and chairs to take moments of your free time to relax, sip on a good drink, and appreciate the incomparable view of the beautiful estate. Enjoy the majestic scenery during sunsets right from the comfort of your own room. This hotel has complete facilities such as indoor and outdoor pools, spas, numerous restaurants, casino, gyms and a water park to make your stay a relaxing and marvelous. Day 1- HKG/ CAN/ SZX Airport Pick-up, transfers to Mission Hills Resort Dongguan. To be able to get to Dongguan, you may take a flight going to Hong Kong, Guangzhou or Shenzhen via several airlines like Philippine Airlines, Cathay Pacific and low-cost carriers like Cebu Pacific, AirAsia and China Southern. Upon arrival, land transfers going to Mission Hills Dongguan will be provided.